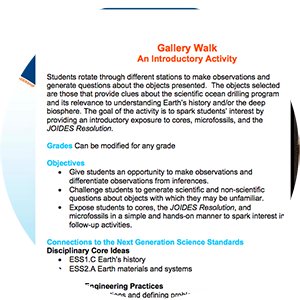 Actvity Summary: In this activity, students are challenged to make observations and generate questions about a select group of objects such as cores, microfossils, the JR, etc. as an engaging way to generate interest and introduce what they will be learning in future activities. This is adapted from the Gallery Walk John Lewis (IUP) presented at the SCIMPI School of Rock 2013.